Dulse (Palmaria palmata) is known as one of the tastiest sea vegetables. It is a type of red seaweed that grows in the cool waters on North America’s coastline and along the coasts of Norway, Iceland and Ireland. Dulse seaweed benefits are vast. One of the primary health benefits of dulse is its high mineral content. It has a slightly salty smoky flavor that many prefer to other seaweeds, and it is a good introduction for those who are new to eating sea vegetables. Different types of seaweed are popular in many Asian cuisines, including those of Japan and Korea, where sea vegetables are used for their flavor as well as for their nutritional value. Western cuisine has gradually integrated sea vegetables, and the health benefit of dulse and other seaweed varieties have become more widely known. Most saltwater seaweed is edible but fresh water seaweed is usually not. Edible seaweeds include different types of red algae, green algae and brown algae. Some of the most common edible seaweeds are arame, kombu, dulse, nori, wakame and kelp. All types of seaweed are rich in many essential minerals, including iodine, as well as antioxidants, amino acids and B vitamins. Dulse is rich in many important minerals and it is especially high in iodine, potassium and iron. Iodine is necessary for a balanced thyroid function and it is used especially in cases of hypothyroidism (underactive thyroid gland) when iodine supplements are usually prescribed. Potassium helps the balance of fluids in the body and plays a role in muscle contraction, and iron is important for a healthy blood and circulation. Dulse is a good source of iron especially for vegan diets or any diets that could be lacking in iron. It also contains significant amounts of sodium, calcium, manganese and zinc. Dulse contains vitamin C and many B vitamins, and it is a valuable source of vitamin B12 for vegans and vegetarians. B12 is mostly present in animal products, and vegan and some vegetarian diets are often lacking this nutrient. Eating fresh or dried dulse regularly is a good way to add B12 into a plant-based diet. It also contains carotenoids, such as alpha- and beta-carotenes and lutein, which are linked to good eyesight and eye health in general. Dulse has all essential amino acids, the building blocks of protein, and it can be used to add protein to vegetarian and vegan diets. Most types of brown and red algae also contain Omega-3 and Omega-6 essential fatty acids. What Are the Side Effects of Dulse? Like all seaweeds, dulse is rich in iodine. If you are pregnant, breastfeeding or on any medication, or if you have any health conditions that are related to unhealthy iodine levels, it is important to speak to your doctor before using seaweeds or seaweed products. Dulse is one of the few types of seaweed that can be eaten raw. If you have a local source of freshly harvested dulse from clean water, the leaves can be eaten fresh. Most of the time the leaves are dried immediately after harvesting and sold as dried powder or flakes or sometimes as whole dried pieces. It does not lose its nutritional value when dried, so the powder and the flakes contain the same nutrients as the fresh product. 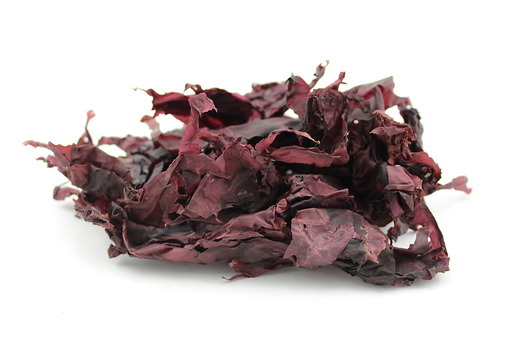 Unlike other seaweed there is no need to soak dried dulse leaves before eating. Dulse is known as one of the best tasting seaweeds and it is also a great snack food. You can sprinkle the powder or flakes on many dishes such as soups, stews or fish dishes to add flavor. You can even fry it; some people like to fry whole leaves in oil until crispy and eat as a vegan alternative to bacon. When added to soups, it can be used as a substitute for salt. For people on a low-sodium diet, dulse powder or flakes are an ideal way to add flavor to foods without having to use sea salt. Dulse is also an ingredient in many green powder drinks, such as Total Living Drink Greens. It is often blended together with chlorella, spirulina and other super foods. These green drinks are an easy solution to anyone who wants to add a lot of nutrients into the daily diet in a concentrated and convenient form and make the most of the health benefits of dulse and other sea vegetables. There are countless health benefits of dulse and it also adds great flavor to many foods. Add the dried powder or flakes to soups or sprinkle it on stews, stir-fries or other dishes, or try it in green drinks together with other green powders. Dried dulse should be stored in a dark, dry place and it will keep at least two years.